A beefy chambray in a with amazing grain. This style uses selvedge chambray from one of the finest mills in Japan. There is something special about a dense chambray with prominent grain. That's the best way to describe this style. It's dense. At 6oz it's built to last. It has very prominent vertical and horizontal grain giving it amazing texture. The color is a brighter blue than our original Indigo Chambray fabric. It's finished with a matching blue selvedge ID. We labor over every construction detail and find subtle ways to incorporate the selvedge. Extensive single needle stitching is used throughout. All our closures are made from true mother of pearl. A finely folded locker loop sits over a box pleat on the back yoke. 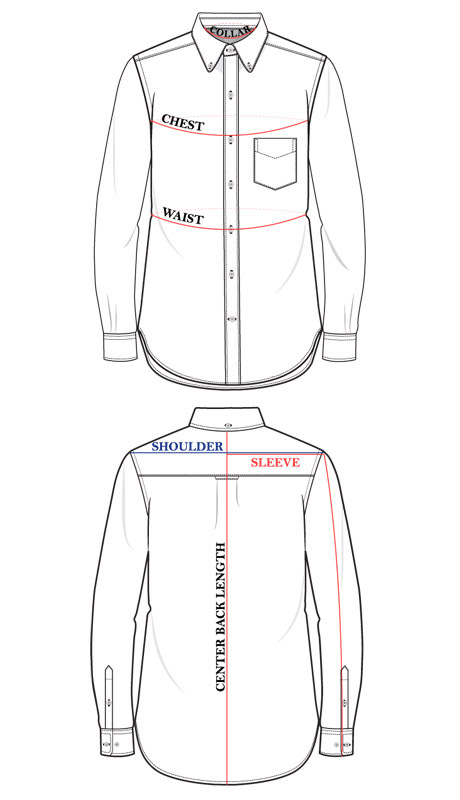 The front placket is also pleated, made the right way, using a true two piece construction. The feel is more substantial and the effort higher, but it's the right way. The back of the placket gets selvedge edges running the entire length on both right and left sides. We also incorporate the selvedge on the back yoke. Nothing flashy, just a cool detail for you to enjoy each time you put on the shirt. An angular chest pocket completes the front. Our cuffs are double button with rounded corners.